The world’s leading provider of smartphones, Samsung has introduced its new powerful and stylish Samsung Galaxy Pro, which the corporation claims as its first Samsung Galaxy devices that supports full QWERTY keyboard to enhance users experiences. 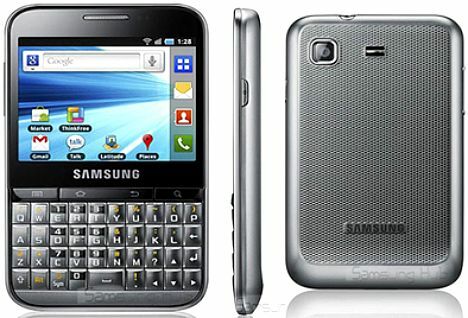 The new Samsung Galaxy Pro is combining a new innovative, crisp 2.8-inch touch-screen display, and is powered by an 800MHz chip, TouchWiz 4.0 UI, 3.0 megapixel camera, lightning-fast HSDPA connectivity, and built-in Samsung Social Hub Premium that offers one-touch access to emails, IM, and social networking accounts. The Galaxy Pro also supports Microsoft Exchange ActiveSync and ThinkFree Office Document Editor for helping users to view and edit Microsoft Word, Excel and PowerPoint documents. Samsung Galaxy Pro which measures 66.7 x 108.6 x 10.65 mm and weighs 103.4 grams is slated to hit the market during the second quarter but its exact launch date and price info are yet to be known.